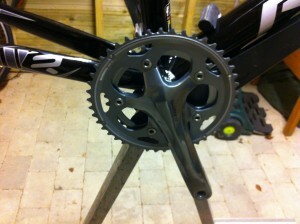 I had decided on going almost pure Shimano 105 components for the drivetrain and shifters. It’s what I have on my road bike where it has done the job just fine, plus I didn’t want to spend a great deal of money on Ultegra components for a bike that will experience some rough riding in mud and rain. 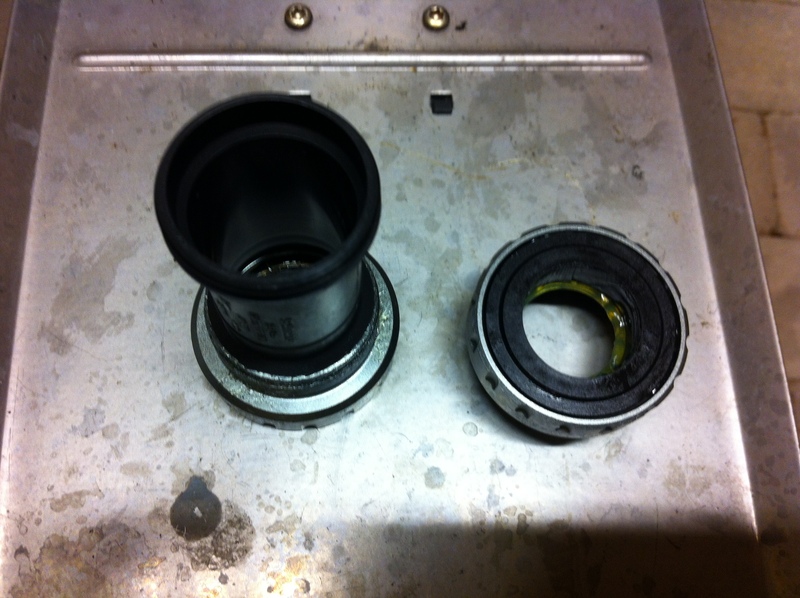 The bottom bracket is a standard 105 bottom bracket. Furthermore I had bought a bottom bracket remover for installing the bottom bracket. Armed with this. I was ready. 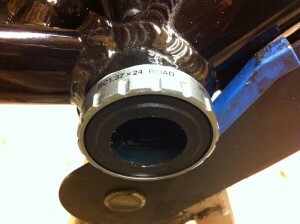 Mounting the bottom bracket is easy. Apply some grease, fasten the right cup which holds the center piece as well (there is an arrow showing you which direction to turn), fasten the left cup and that’s it. The most important part is to not overtighten the cups. For the crankset, I had decided to go with the Shimano CX50 cross crankset which has 46 and 36 teeth chainwheels, as opposed to the normal 53-39 or 50-34 teeth chainwheels that you’ll find on a roadbike. 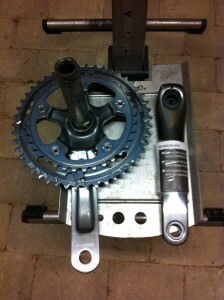 Mouting it is described in the techdocs from Shimano and was almost as easy as mounting the bottom bracket. A bit of grease on the spindle. 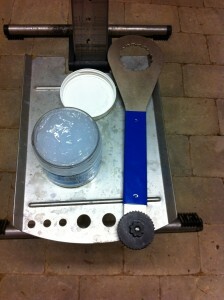 Push the part with the chainwheels through the bottom bracket and attach the left part. Tighten it, just a tad, and then mount and tighten the plastic cap (it must be done before tightening the left arm completely). Now make sure that the so called stopper plate (a little thingey that goes into the groove on the left arm) is in place, and tighten the bolts. I used a torque wrench to make sure that I wasn’t overtightening the bolts, Shimano recommends a torque between 12 – 14 Nm. And that’s it, the bottom bracket and crankset was now installed.